Miami Beach invites eco-conscious travelers from around the world to experience a variety of sustainable options, from destination resorts to innovative restaurants, throughout the city that are dedicated to preserving Miami Beach’s seven miles of pristine sand. Miami Beach is inviting eco-conscious travelers from around the world to experience a variety of sustainable options, from destination resorts to innovative restaurants, throughout the city that are dedicated to preserving Miami Beach’s seven miles of pristine sand. As a year-round vacation oasis, Miami Beach businesses continue to expand and enhance efforts to lessen their impact on the environment including the elimination of plastics use, dedicated recycling programs, complimentary water-filling stations, using only locally-sourced ingredients and more, all without sacrificing the lifestyle and luxury visitors expect. 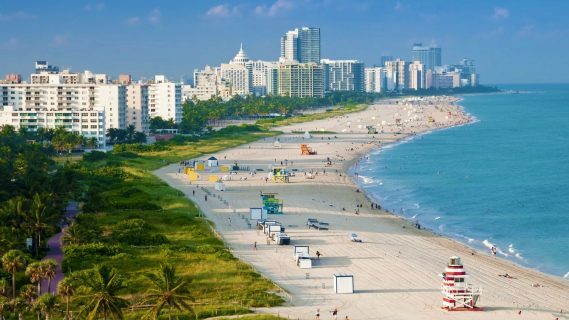 In addition, the City of Miami Beach has introduced a number of new programs and initiatives to make it easier than ever for tourists to enjoy a city like no other place in the world while keeping the local environment top-of-mind. 1 Hotel – A Silver LEED certified project, paper or plastic products won’t be seen on the property. Instead, travelers will find, “triple clear” water filters in all taps to replace plastic bottles and the hotel has made use of reclaimed wood throughout the interiors. The Palms Hotel & Spa – A classic eco-conscious hotel and a member of Florida Green Lodging, The Palms’ rooms include environmental bathroom elements that make guests feel like eco-warriors. More than 65% of the hotel’s furnishings are made from recycled content or are locally produced. The Aveda Spa and in-room Aveda toiletries are composed of up to 90% organic ingredients, sustainably sourced and packaged in 100% post-consumer recycled containers. The Standard Hotel – A fellow member of Florida Green Lodging. The resort is located on Belle Isle on the Venetian Causeway – away from the usual city life. The hotel is practically floating in Biscayne Bay with an indoor spa, spacious stadium-style hammam. The property promotes an overall sustainable lifestyle with a restaurant specializing in organic cuisine. Soul Tavern – One of the founding members of #PlasticFreeMB, this plant-based gastropub focuses on health-conscious cuisine and lessening their environmental footprint. Likikoi – Enjoy organic, locally-grown produce that features seasonal fruits and vegetables, meats that are humanely treated and raised without steroids or growth hormones and seafood carefully selected and eco-friendly. Planta – This plant-based, upscale, fine dining eatery commits to using quality products from ethical suppliers. Celebrate Earth Day at the Miami Beach Botanical Gardens – Visit the urban oasis at the heart of South Beach throughout the month of April to experience cultural events including the Recycle Runway Fashion show, an Arbor Day Tree planting, or join their community compost hub. Visit Woosh Water Stations around the city – The 15 conveniently-placed water stations around Miami Beach encourage the reduction of plastic water bottles. Their patented Ozone (O3) purification technology filters everything out – without removing healthy nutrients. Explore the city through the Rising Above app – Explorers are be able to discover the city’s environmental hotspots on water or land with guided tours and information on how the city is building a resilient urban environment. For more information on the best ways to be sustainable on Miami Beach, download the Miami Beach app at http://www.miamibeachapi.com/.